To exploit novel ferrocene-based small molecules with long conjugated structures as visible and electrochemical multichannel chemosensors, four conjugated ferrocene ethynyl semicarbazide derivatives (Fc-X-An) were synthesized via the Sonogashira coupling reaction. The synthesized Fc-X-Ans are 2-(4-(ferrocenylethynyl)benzylidene) hydrazine-1-carboxamide (Fc-Ph-An), 2-((5-(ferrocenylethynyl)thiophen-2-yl)methylene)hydrazine-1-carboxamide (Fc-Thie-An), 2-((9-ethyl-6-(ferrocenylethynyl)-9H-carbazol-3-yl) methylene)hydrazine-1-carboxamide (Fc-Cz-An) and 2-((10-ethyl-7-(ferrocenylethynyl)-10H-phenothiazin-3-yl) methylene)hydrazine-1-carboxamide (Fc-PTZ-An). The recognition abilities of the semicarbazide derivative Fc-X-Ans for several anions were evaluated from visible absorption spectra, 1H NMR, and electrochemical technique. 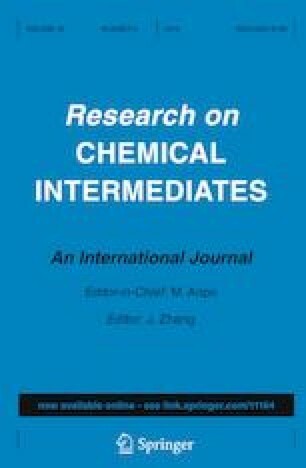 The online version of this article ( https://doi.org/10.1007/s11164-019-03808-1) contains supplementary material, which is available to authorized users. The authors thank the National Key Program of China (Project Grant No. 2017YFB0307800) and Science and Technology Planning Project of Guangdong Province, China (Project Grant No. 2017B090911002) for financial support. We also thank the Beijing University of Chemical Technology CHEMCLOUDCOMPUTING Platform for support with calculations.